Artists Include: Angel Jo, Daren Wilson, Peter McBride, Andrew Kontrabecki. Opening Reception Friday Feb 21st. 6-9pm. There is beauty in functional pottery in its potential to contain. A cup of tea, a homemade meal, a flower gathered from a walk all transform the object to take on a new image and role. With function, the object becomes a collaboration full of meaning, sometimes beyond the imagination and intent of the creator. 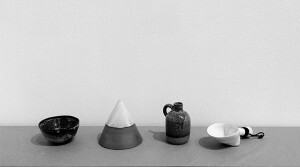 Image in the Object showcases the work of four artists in the bay area who use ceramics as a tool for creative usability. Each body of work has gone through a similar process of building and firing, but the variety of design all began with the artist’s sense of the environment the pieces will ultimately live within.